As spring approaches, I’ve seen more and more customers in the local fishing stores here in Cleveland. People buying new gear, getting reels repaired and generally just itching to start fishing again. 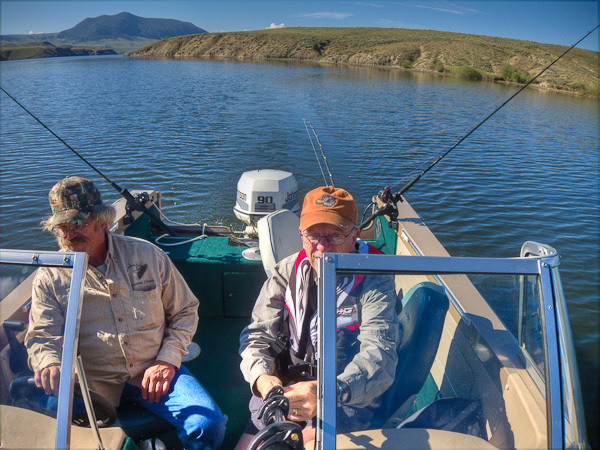 Once the gear is ready, the question is - where is the best place to fish this spring? Let me suggest a destination that will be new to most people on the east coast and in the Midwest. 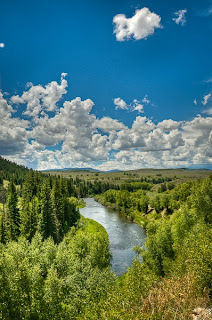 About 127 miles northwest of Denver, you can turn back the clock to 1874 and enter what’s now known as “Sportsman’s Paradise.” With fishing available in streams, rivers, ponds, lakes and reservoirs, there is something for every fisherman - novice or pro. Rarely, do towns maintain their history this well, but Kremmling is an exception. 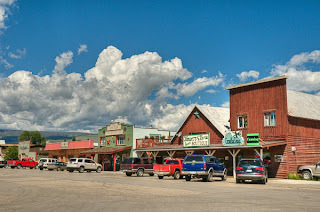 Rudolph Kremmling started a trading post here around 1874 and the city still has 65 buildings constructed between 1885 and 1913. Many now support the “in-the-know” sportsmen who flock here each spring. From the time you pull onto Park Avenue, you sense the small town magnetism. 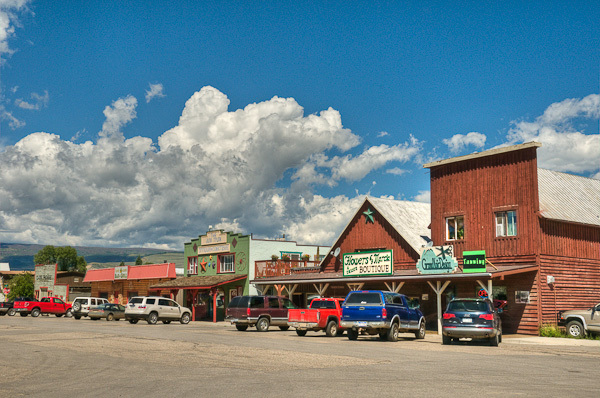 For a quick orientation, stop at Kremmling Chamber of Commerce (203 Park Avenue) where Kacey or Marty can point you to all the attractions within minutes of their office. · Liquid Descent Whitewater Rafting offers trips for all skill levels up to and including the only Class V rapids in the area. · Slower waters offer the balance of boating opportunities from canoeing, to kayaking to power boating. · Prefer to travel on wheels? How about biking or motorcycling the beautiful State and National Scenic Byways that traverse this area. · Maybe a little more daring? How about dirt bikes, BMX, ATV, OHV and four-wheeling the many miles of sanctioned off-road trails. Kremmling has the distinction of being at the confluence of three major waterways: The Colorado, the Blue River and the Muddy River, and is home to Gold Medal waters, meaning the best the state of Colorado has to offer. Residing outside Cleveland, the majority of my fishing revolves around largemouth bass, walleye and lake perch. Being in Colorado however, offered the opportunity to accompany Dave Parri and attempt to learn the art of fly fishing. I talked to Dave the night before our expedition and warned him that he was about to encounter a total rookie when it came to fly fishing. No problem, he assured me, he would bring the waders, gear, flies and everything needed for the morning of fishing. We met near the shores of the Colorado River and he guided us to one of his favorite hot spots. Keeping upright on the slippery stone bottom was my first challenge, followed quickly by learning the language of the insects on and above the water. Even if I had known how to cast a fly rod, without a guide, I would never have thought to observe the type insects around the water. Dave explained how his lures would mimic the particular nymph fly behavior at any given time. Depending on temperature rise in the river, sometimes you want to place your bait below the water and other times you might fish the surface. 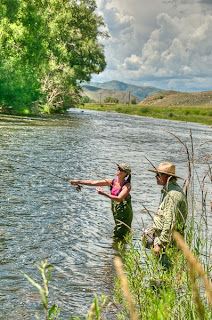 Fly fishing, I discovered, is part art and a good part science. Without both, you are sunk. Within minutes of my first cast, Dave yelled for me to set the hook. Huh? I didn’t feel a thing. “You’re a bass fisherman aren’t you?” asked Dave. “When surface casting for trout, you need to watch your bait as the trout will break the surface and gobble it up.” Okay, I’m ready now. See fish – set hook. A couple minutes later, a fish rises to dine and I am determined to set the hook before this next one gets away. “Whoa” cries Dave, “you are setting the hook just like a bass fisherman as well. If you use that amount of force on a brown trout, you’ll tear the hook right out of his mouth.” Wow, this requires reprogramming the fishing part of the brain, wherever that is. Thanks to Dave’s continued guidance and unfailing patience, within a couple hours, I had managed to land two decent 12-13” brown trout. Not seeing any other fisherman land anything that morning made my accomplishment all the more satisfying. Dave Parri operates both a hunting and a fishing guide service. He can be reached at 970.725.3531 or on his website at http://www.traditionalelkhunt.com. Dan and Deb Murphy operate The Fishin’ Hole at 103 Park Avenue in Kremmling. In a small building, they pack in the goods you’ll need for camping, fishing and hunting and the knowledge of what to do with them. In a typical small town manner, they are only too happy to share their knowledge with locals and visitors alike. Dan’s low key manner extends to his guide service, trying to show his guests a good time fishing without spending an arm and a leg. That particular morning we drove out to Wolford Reservoir, and met up with Jeff Miller, owner of Wolford Marina and Wolford Campground. Jeff set us up with a 16’ motorboat, bait, gear and some words of wisdom about recent catches. The marina can set you up with boat rentals from a two person paddle boat to a pontoon boat depending on the size of your party. Dan brought along some fantastic food that Deb had put together for us for lunch and we were ready for the day on the lake (reservoir). With Wolford Mountain as a backdrop and rolling hills in the opposite direction, it was a wonderfully remote feeling, even though we were no more than 15 minutes outside of town. We took off trolling north, and I was quite impressed by the pristine shorelines and lack of humanity. 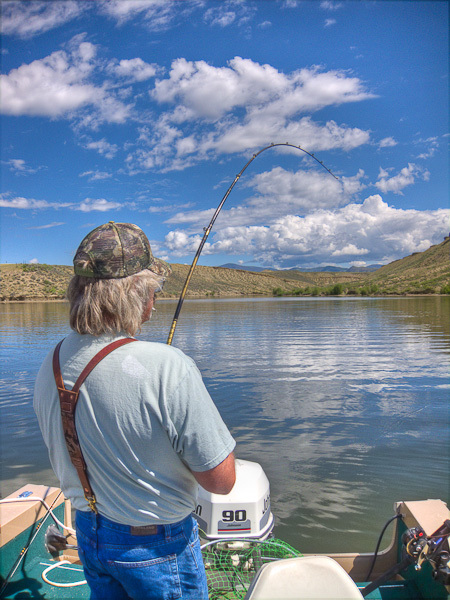 This is truly the place to come if you want some quiet time – just you, 1,550 acres of water and the fish. And fish there are: Rainbow trout, Brown trout, Snake River cutthroat trout and Kokanee salmon. Before lunch, I had caught and released my first couple beautiful Rainbow trout. Taking a break, we drifted in an inlet underneath a roosting set of Osprey with two or three little ones peering over the edge of their nest. What a great place to stop for lunch and enjoy Mother Nature. You can reach Dan at The Fishin’ Hole at 970.724.9407. This was my first trip to Kremmling and I lucked out staying at a marvelous place called Base Camp Cabins (315 River Ln.) 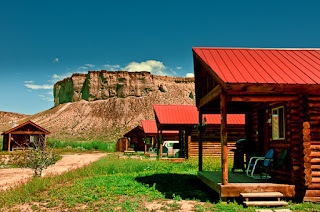 Immediately below the famous Kremmling Cliffs, ten cabins of varying size put you right in the middle of the sporting activity but separate enough for privacy and quiet. 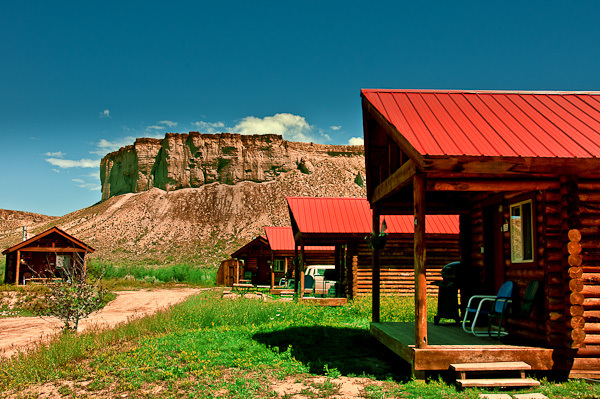 The cabins are set on eight acres bordering the Muddy Creek, yet within an easy walk to local stores for your provisions. Each cabin is traditional log cabin design with gas fireplace, front porch with BBQ grill, kitchenettes, gas fireplaces with remote starters, telephones, satellite TV, and free WiFi. Pets are welcome as well. The beds are oh so comfortable and the bath is spacious as well. 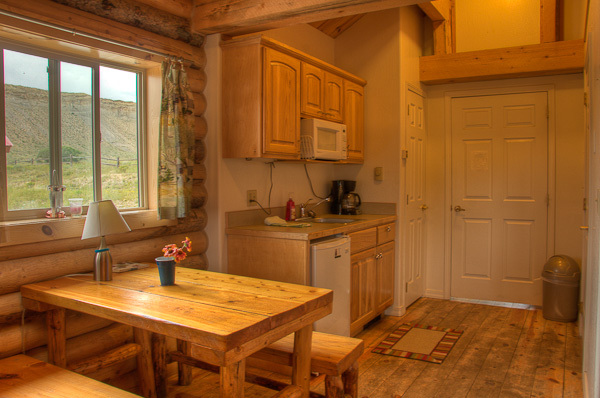 Each cabin has parking immediately outside the front door for maximum convenience. I’ve never felt so “at home” in a cabin before – I hated to leave. Contact Kim Douglas, managing owner, (866.724.9559) for a reservation. But first go to Facebook and “like” Base Camp Cabins. That will get you a $20 coupon. You are in wild game country, so expect there to be lots of choices on the town’s menus. I sampled the fare at three restaurants while I was there. I had breakfast at Moose Café and then dinners at Quarter Circle Saloon and Los Amigos. All were ever so hospitable and the food was fresh and tasty. Somehow small town dining is just so much more relaxing. Denver International Airport is about 2-1/2 hour’s drive from Kremmling and the scenery is worth it. If you’re so inclined, you could take an air taxi service and fly right into Kremmling at McElroy Airfield. Either way you get there, you’re sure to have a great, active time.